Edith Eckart was born on March 25, 1919, in Brooklyn, New York. She graduated from Cornell University with a Biology degree in 1941 and taught science at South Kortright Central School in Hobart, New York. Edith became a WAVE in World War II. She met her husband, Robert R. Eckart, Jr., in Cambridge, Massachusetts when she was studying radar at MIT. They eventually had four children and eight grandchildren, all of whom reside in Humboldt County. In the late 1970s, after Edith moved to Arcata to join her children, she became "Edilith"-a grandson's pronunciation of her name. Edilith loved how it sounded like Edelweiss, a white high mountain flower, and decided it suited her. Edilith's activism spanned many years. In the 1960s and '70s, she was involved in the struggle for civil rights and the environment. Then her focus became world peace. After traveling to the Soviet Union in 1981 with Danaan Parry, founder of Earthstewards Network, Edilith went on to lead 15 people-to-people diplomacy trips to the USSR. In 1990 Edilith traveled to Japan for ceremonies marking the 50th anniversary of the bombing of Hiroshima and Nagasaki. She made multiple trips to Israel and Palestine in the 1990s, standing in silent vigil with the original Women in Black. Edilith was one of the founding members of Veterans For Peace Humboldt Bay Chapter 56, in 1991. In August 1996, then President Sanford Kelson traveled all the way from Pittsburgh, PA to Arcata to present her with the VFP President's Medal. He then proceeded to nominate her for the VFP National Board. She served VFP well and was re-elected to the board in 1999 at the age of 80. Edilith violated the US travel ban and sanctions against providing aid to Iraq in 1998 when she helped deliver $4 million worth of medicines to Iraqi hospitals on a delegation led by Ramsey Clark. On the return trip she and Fredy Champagne hatched the idea of the VFP Iraq Water Project, and proceeded to birth it against all odds. 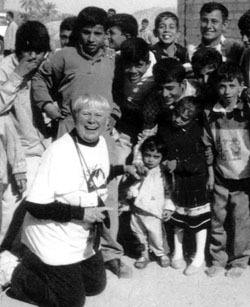 In October 2000, the first team went to Labanni, a small village near Basra, to repair water treatment plants that had been destroyed by US bombing. A few months later, Edilith went to Iraq on an inspection tour to verify that fresh water was actually flowing to the people of Labanni. The Iraq Water Project has rebuilt six water treatment plants in small towns in Iraq and their work continues, with the next project planned for Fallujah. Over the years, Edilith was arrested numerous times for her involvement in protests and demonstrations. Woody Powell remembers her crying as a group of activists marched through the gate of the School of the Americas at Ft. Benning one year to be arrested and processed. He says, "Her passions were great and always noticeable." The night of her passing, Edilith had been planning to attend an Arcata City Council meeting to protest the subdivision of a lot across the street from her home, fearing it would negatively impact the creek there. She died with her boots on. Thomas Sinclair Harper, M.D., our oldest VFP Chapter 56 member, died at home on Friday morning, January 20, 2006, two months shy of his 91st birthday. Tom was born in Grand Junction Colorado on March 24, 1915 to parents Sinclair and Mabel Harper. He had two brothers, Robert and John. A fact about Tom little known to VFP friends is that he spent his youth playing tennis. He distinguished himself in the sport, earning trophies in Colorado singles tournaments and playing doubles with his father. He even played a match with tennis great Bill Tilden (which he lost). Tom first graduated from Cal Tech in Pasadena, then received a medical degree from the University of Colorado in Denver in 1942. Immediately after graduation, he joined the Navy, where he served for the remainder of World War II, stationed in Hawaii and the South Pacific. Not yet having completed his medical residency, Tom was thrust into being a surgeon on board a storm-rocked naval ship, where he performed an appendectomy by reading from a manual and getting advice on a phone. The patient survived. After the war, Tom decided to switch his medical specialty to psychiatry. He studied at the Menninger Clinic in Topeka, Kansas, before moving east to Westchester County, New York. Tom was a strong believer in non-violence and a peace activist for most of his life. In the 1960s, he attended many anti-Vietnam war protests, including the 1968 protest at the Democratic Convention in Chicago, as well as large protests in New York City and Washington D.C. In 1974, at age 59, Tom packed all he owned into a VW van and moved to Mendocino, California. Tom liked his Volkswagen, but after five engine replacements he finally switched to a Honda Civic, a model to which he was loyal 'til death. In 1990 Tom moved north and opened his psychiatry practice in Eureka. His long medical career spanned more than 60 years. Big changes came in 2003 when, at age 88, Tom fell and fractured his hip. Veterans For Peace friends rallied around him, taking one of their Friday evening peace vigils to a grassy spot in front of his hospital window. Nurses helped Tom move near the window so he could participate in the vigil from his room. He sat waving his arms practically the entire hour, in solidarity with his friends. He mended well from that fall and was soon able to rejoin the vigil on the Arcata Plaza. He was one of the most stalwart participants in that ongoing action. In recent years, Tom was incredibly active and expressed interest in everything that was happening in his local peace community. When he turned 90, VFP-56 threw a birthday party to raise money for the G.I. Rights Hotline, and members presented Tom with a beautiful glass plaque for his life-long dedication to peace and justice. He was the life of the party, telling jokes about George W. and eating more than his share of birthday cake. 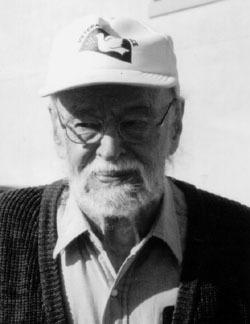 Tom also was an active participant in the Marsh Commons co-housing association where he lived. Marsh Commons residents John Schaeffer and Kit Crosby-Williams, familiar faces at the Friday vigil, were especially fond of him. He was affectionately known as Tomas to his second family from Mendocino, Marlene, Shean, Terry, Marla, Heather, James, and Laura Greenway, to whom he was a friend, father, intellectual companion and confidant. Tom's brothers and his ex-wife Maureen preceded him in death. He is survived by his sons Richard and Paul of Arizona, his daughter Joan and son-in-law Don Morgan of North Salem, New York; and granddaughters Elizabeth Morgan and Katherine Morgan.